Whether you are researching a school project or are just interested in our favorite aquatic mammals, you’ve come to the right place. Click on any of the links under “Manatees” on this page and see our Helpful Hints below to get started. If you are reporting an injured manatee, please click the blue box below. If you are just getting started, you may want to begin with our Manatee Facts page. We have a variety of resources at our Education Materials page. There’s some links to resources for both educators and students. 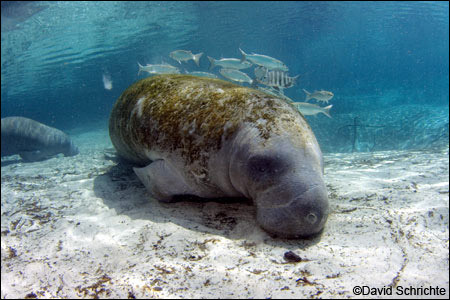 Go to Manatee Viewing Areas or watch our Webcams at Blue Spring State Park. For some cute mom and calf photos and video, check out the Reproduction page. We’ve got protection tips for boaters and some for divers and swimmers. If you boat in Florida, get one of our free waterproof banners. Boaters can also get a free boat decal, or you can get a free public awareness sign if you are a Florida shoreline property owner. These can be found at our public awareness materials page. Call 1-888-404-FWCC (3922), or #FWC or *FWC on your cell phone. You can also send a text message to Tip@MyFWC.com or use VHF Channel 16 on your marine radio. If you’ve looked over all the pages in this section and still can’t find the answer to your manatee question, please send us an email at education@savethemanatee.org.